The Ex British Somaliland( Hargesa), today self declared indepedant state of Somalia is running the second democratic election in the Horn of Africa while the Puntland has became a a pirate-land, ( Bassaso) and Somalia ( Mogadishu ) in total chaos . The May 2010 elections in Sudan and Ethiopia have been ragged, while in of Kenya violently contested. Three men, Dahir Riyale Kahin, Ahmed Mohamud Silanyo and Feysal Ali Warabe, are vying to become president of the unrecognised region, a haven of relative peace in the northwest of Somalia. The candidates had agreed to hold campaign rallies on different days in order to avoid f violence between supporters. Somaliland became a de facto independent Republic in 1991, after the collapse of the central government in Somalia, the main part of the territory declared its independence on18 May 1991. It is the successor state to British Somaliland which was independent for a few days in 1960 as the State of Somaliland. Abderahman Ahmed Ali Tuur became its It s 1st president in 1991 . In 1993 Muhammad Haji Ibrahim Egal was appointed by the parlament of the clan eleders. Egal was reappointed in 1997, and remained in power until his death on May 3, 2002. The vice president, Dahir Riyale Kahin, was sworn in as president shortly afterwards, and in 2003, Kahin became the first president of Somaliland elected in a free and fair election. The War in Somalia between the Islamic Courts Union, the forces of Ethiopia and Somalia’s transitional government did not touch Somaliland. Earlier this week, overall Shebab leader Ahmed Abdi Godane, a native of Somaliland, issued an audio message warning the breakaway state’s population that they would “face the consequences” if they cast their ballot. Somaliland’s presidential candidate, Faisal Ali Farah, has lived for many years in Finland. Faisal Ali Farah lived for several years in Finland. Finnish observers are among the group of tens of foreigners overseeing the elections. It is feared extreme Islamic groups ruling in Somalia could try to interfere with the poll and security is tight in the region. Observers say long queues have formed outside polling stations. 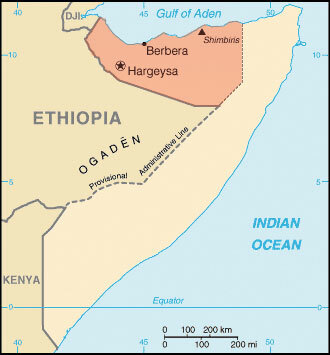 Somaliland proclaimed independence in 1991 but has failed to gained the recognition of other states. Compared to the chaos in Somalia, conditions in the region are calm and stable.